Yanka Kupala's park was founded on the right bank of the River Svisloch according to the project of architect I. Rudenko in the middle of the 20th century. Before World War II on this site there were several wooden buildings that were ruined in the first days of the war. Among them was the house, where the poet lived in 1927-1941. At first in the center of the park the monument to Gritzevetz stood. 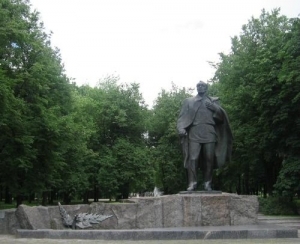 In 1972 the monument to the great Belarusian poet Yanka Kupala was built. One of the favorite places of citizens is the fountain 'Venok' (wreath), dedicated to the ancient holiday 'Kupalye' (bathing). In 1959 the Yanka Kupala's museum was constructed. In the new building architects tried to convey the interiors and the atmosphere of the original house. Unfortunately, the biggest part of Kupala's archives was lost during the fire. But due to the dedicated work of poet's wife and the members of the museum now it has at its disposal a big collection of autographs, photos, documents and poet's personal belongings.